Although it’s more complicated than the tv shows suggest, this eNews offers a simple explanation of hearsay evidence for people going to court without a lawyer. It also explains how you can avoid having hearsay evidence cause problems in a trial if you identify it and plan an alternative when you prepare. All evidence presented in a trial must be “admissible”. The word “admissible” means that the law of evidence will permit the judge to admit it as evidence in the trial and consider it when deciding your case. Although there are exceptions, evidence that is considered “hearsay evidence” is normally not admissible – it’s “inadmissible” and won’t be allowed at a trial. • that is being used to prove the truth of the statement. An example of hearsay would be a witness, Tanya, testifying about what someone else, Raj, said outside the trial and the trial judge being asked to believe that what Raj said was true. Hearsay evidence carries with it the risk that the reported statement is not reliable. In our example, Raj is not at court to be questioned about his statement. Tanya may not have heard or understood him correctly. Because of the possibility that hearsay evidence is not reliable, this form of evidence is usually not allowed at trial. You can avoid the problem of hearsay evidence by having Raj come to court to testify. 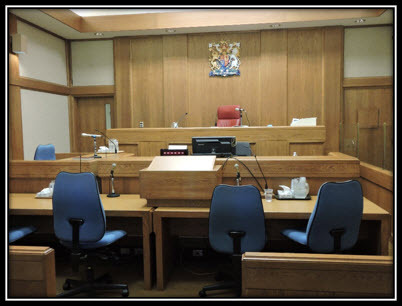 When preparing for trial, take time to consider what evidence you wish the judge to take into account at the trial and whether that evidence might be hearsay. One suggestion is to make a list of your key points and how you will prove those points. If that proof involves hearsay evidence, then you may want to look at other ways of proving your point. In this example, it is hearsay for Tanya to tell the judge what Raj said to her. However, it is not hearsay evidence for Tanya or Raj to testify about what Joe said to them. This type of evidence is an exception to the hearsay rule – an “admission” by a party to the lawsuit, Joe. In fairness to Joe, he will have a chance at trial to deny making the statement or to explain what his statement meant. It is best to avoid hearsay if you can, but in some cases a trial judge does have discretion to allow hearsay evidence. In family court proceedings, a trial judge may allow evidence of a child that is considered reliable even if that evidence is hearsay: Family Law Act s. 202. The law of evidence also allows hearsay evidence to be admitted in a trial if the judge decides that evidence is necessary and reliable. In circumstances where you may need to rely on hearsay evidence, you should tell the judge why the evidence is necessary and reliable. For instance, Tanya’s testimony about what Joe said to Raj may be necessary because Raj is out of the country and not available to testify at the trial. 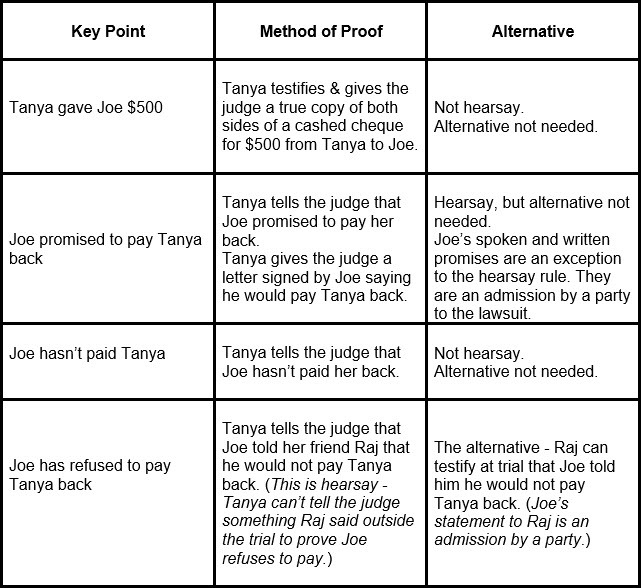 The evidence may be reliable if Joe wrote in an email to Raj that he would not repay the money and Tanya has a copy of that email to show the judge. There are other more technical exceptions to the hearsay evidence rule, including exceptions that are set out in legislation. Talk to a lawyer to get more information or legal advice on preparing and presenting evidence in a trial. Some lawyers offer unbundled services where you pay them only for the work you want them to do for you, such as helping you prepare for a trial. For more on evidence, see The first rule about evidence – it must be relevant.